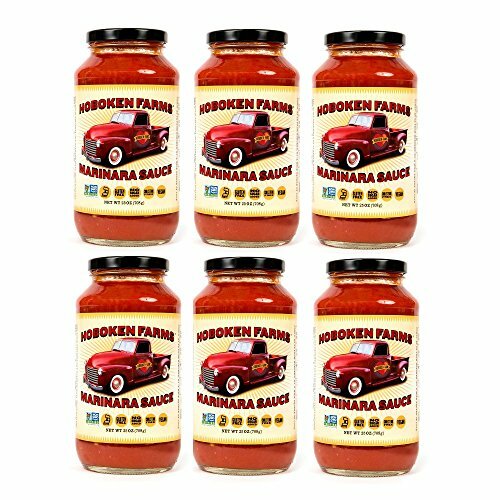 Why was Hoboken Farms sauce named Top Picked in the country by the Wall Street Journal? Why did the New York Times call us "a comfort-food extravaganza"? Did you know we were called "The absolute no-holds barred best sauce ever" by opensky.com and The cake Boss? Oh, and we also won the Addy award for best design. Our BIG RED Marinara Sauce is prepared with only ULTRA PREMIUM whole fresh tomatoes, fresh onion, fresh garlic, fresh basil and pure olive oil. We never, ever use any tomato paste, added sugar, or fillers. Here at Hoboken Farms central, we simmer our batches slowly in order to create the most glorious sauces in the ever lovin' universe. We are offering our product for the first time to people outside of the Hoboken area...delivered in our mess-free, hassle-free sauce shipping system. If you have any questions about this product by Hoboken Farms, contact us by completing and submitting the form below. If you are looking for a specif part number, please include it with your message.